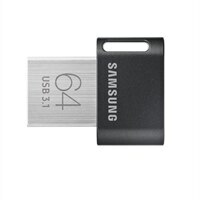 Samsung FIT Plus MUF-64AB - USB flash drive - 64 GB - USB 3.1Expand your storage with a compact fit designed to plug in and stay. Read speeds up to 300 MB/s with the USB 3.1 standard. Expand your storage with a compact fit designed to plug in and stay. Read speeds up to 300 MB/s with the USB 3.1 standard.